News ► Classic Kingdom arrives in KHUX JP on 9/6, get Starlight to use in KINGDOM HEARTS 3! KINGDOM HEARTS Union X[Cross] Japan is celebrating its 3rd anniversary this month, and the staff have prepared 7 announcements celebrate the occasion. The Big Present Campaign returns this month! Players can pull from a daily free draw for a chance to get Moogle & Sora KHII Ver medals, which can be used to earn in-game jewels and act as vouchers in a lottery for luxurious prizes. Campaign Coins have been introduced this month. Players will receive coins for all of the jewels they've spent since they've started their adventure, which can be used to redeem powerful medals and other rewards in special boards. Sparkly, parade-like avatar outfits have arrived, as well as the 3rd anniversary raid boss. Sephiroth makes his debut in a new event scenario. Are you willing to face him in battle? Chatrooms will be introduced in the Version 3.0.0 update! Chat with others about your favorite subjects, and you can even use character dialogue and stamps. Players have received 13,000 jewels as a present for the 3rd anniversary. Classic Kingdom will be introduced in the Version 3.0.0 update, which will be added to the Japanese version following maintenance on September 6th from 11:00~17:30 JST. (There's currently no confirmed release date for Global version.) Check out 5 minigames that will be available to play in KINGDOM HEARTS III. Compete with your friends to get the high score. Achieve a specific score goal, and earn the Starlight Keyblade to wield in KINGDOM HEARTS III! KINGDOM HEARTS Union χ [Cross] Thank you for our third anniversary. It is Nomura for the first time in a while. Although it may not have been as long as it could have been. We're counting from "Union X"'s operation but, it has not been three years since "Union X" launched in its earliest form. If we think of it in terms of "X[chi]", it has been more than five years already, but I guess that doesn't count. That's why it's funny to think of the third anniversary, but this time it seems to be a different kind of celebration. 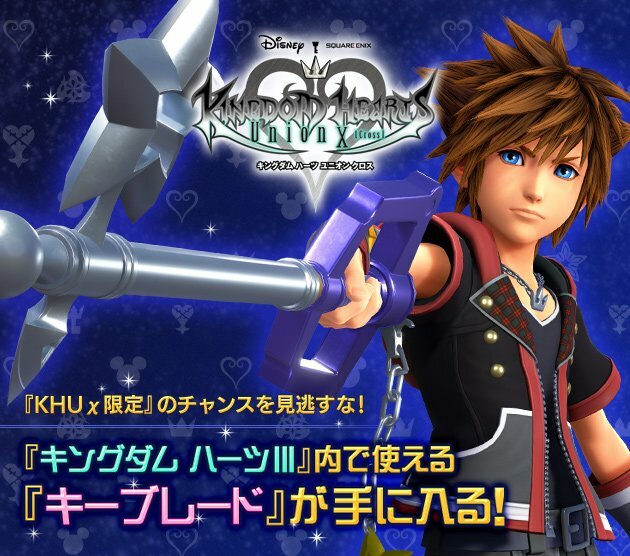 Although the development of "KINGDOM HEARTS III" is still taking a while, the mini game "CLASSIC KINGDOM" in "KINGDOM HEARTS III" is ready to be implemented with a "gameplay system that allows you to play" within "Union X." But saying "the gameplay system that allows you to play" is too long, so I've been calling it "X3". Even though it's short, I fear you might mispronounce it. I read "X-trace". "X3" isn't just about "CLASSIC KINGDOM" but implements parts of Sora's mobile device from "KINGDOM HEARTS III" and it's where the new conversation tools will be located. For details about this, please also refer to announcement notices in the game. I have kept you waiting so long, but the main scenario will be updated next month. Actually, the scenario part of Union X, aside from myself, was partially written by the staff of KINGDOM HEARTS III and I am sorry that couldn't update it quicker, but the wait is finally over. I think that after this, the heart of the story will be evident. The next time the main scenario will be updated, there will be new characters, and the connection between this character and that character will be revealed. I think it will be an interesting development. Until now, the matter of existing Disney Worlds needed to be dealt with first, but soon we will finally be visiting the new world. Along with that, we are preparing new mysteries and developments in the world of "Union X", so please continue to enjoy "KINGDOM HEARTS Union X[Cross]". Thanks to everyone, we were able to reach "KH3" and the "3rd anniversary", so rather than apologizing, we'll distribute celebratory gems (jewels?). Well then, see you soon. Visit the 3rd anniversary website here. Looks like we will find out if WIR is indeed the new Union world or not. Glad this is happening sooner than later. Moment of truth is finally at hand. I feel strongly that this should be relegated to the KHUx subforum because it threatens to tear down the psychological barriers I've painstakingly constructed between that...thing...and the series in general. I mean first it's TWEWY and now this, where will it end. Hey Sora's eyes are blue again. Excited to actually get a decent reward in KHIII thanks to the abuse KHUX has inflicted on its players. Going by the text in the actual announcement, it should be Ï‡3, not Ï‡[SUP]3[/SUP], right? Also, I took the spelling to be "ex tres," like the Spanish word 3. Open to being wrong, but that was my first thought. At any rate, I'm pumped to finally have Classic Kingdom. And this time we don't have to wait for like three weeks while they dripfeed teasers. We were going phonetically since you wouldn't be spelling it out at all. Extress? Is it supposed to be pronounced 'tres' instead of 'tress'? I remember back earlier this year that Nomura mentioned some project and it was translated as "Extrace" with that exact spelling. But anyway, that new Sora render looks great! And how exciting to get the chance to unlock Starlight in KH3! I still wonder if Shooting Star is canonically going to be some evolved form of Starlight, and this unlockable base Starlight is just a nice tie-in for KHUX players. I can see that we'll be getting no sleep if we don't say Ex-Trace. FINE, I CHANGED IT. HAPPY NOW? Prooooooobably a reskinned transformation. Given that it's not (as far as we know) unlockable in any other way other than playing KHUX, they might not want to go to the effort of making an exclusive transformation that only some people will get to see. Then again, that might actually even be more incentive for them to go ahead and give it its own exclusive transformation, as that would be a nice reward for dedicated fans and KHUX players. Hmmmmm. That's the thing, the Keyblade is nice but having an exclusive transformation and design is a bigger incentive to get people to download and play. Some people right now are like "play the game for a Keyblade? No thanks" but they may change their tunes if there's a special transformation. Starlight will definitely have unique transformations. Ok thanks. I don't think I've even gotten through the tutorial in Hux, it just didn't really interest me. Now i miss extras for KH3 ._. That's why it having a transformation may be a bit more enticing to some. Edit: and here's an angry post about how it's wrong for a mobile game to hold a Keyblade hostage. Lmao all you have to do is play some minigames and people are acting like its that big a deal? I bet you won't even have to do anything other than the tutorial to access the minigames either. Similar to how they implemented features so that you get the Pet companion super early in the game as a newcomer, I'm sure they'll make it so that a newcomer can almost immediately access these minigames if that's all they're interested in. And yet people are like IM NOT DOING THAT FOR A KEYBLADE NYEEEEEHHHHH. Eh, it is what it is. Some people don't see the use in downloading it and playing for a Keyblade, some don't see why the Keyblade should only be accessible by playing a mobile game (they're ignoring the point and recent controversies to be at that stage lol), and some are trying to get their friends to download and play. This is all data I can pull from KHI's social media channels so I don't know the reactions that extend further away from that. But it's also amazing how the general public reacts to news like this. Classic Kingdom was announced back in April and I think a lot of people may have forgotten about it so they're excited about this. I'm excited because I can now load up KH3 and immediately have Sora wield the Kingdom Key and the Starlight Keyblade, and be able to swap between the two in Olympus. That excites me. You know, some of us sunk a hefty bit of time into KHUx before dropping the game or getting pushed out of it for any number of reasons, so calling the aversion to it "kneejerk" is kind of lousy. Enjoy the game if it's your thing by all means, but there's enough public testimony against it that you could at least more accurately qualify the anti-mobile faction as "spurned" or maybe "triggered." While I'm not sure this is any worse than the fact that Nomura is still making vague promises about "a new world" getting implemented for the people who still care sometime in the "soon," it is still pretty sketchy if they fix a whole Keyblade with transformations and everything to this mobile title; a skin is one thing but come on, at least make it DLC so we can complain about having to pay for it like a normal fandom.